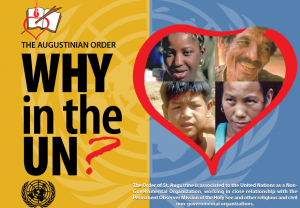 Augustinians are associated with the United Nations as a Nongovernmental Organization (NGO). We took on UN ministry as have other religious institutes of men and women like Franciscans, Dominicans and Carmelites. Other Christian communions including Lutherans, Methodists and Quakers and faith communities of Jewish, Moslem, Buddhist, Hindu, Jainism and Shinto believers have UN presence too. Faith-based NGO motives include witnessing our beliefs on the worldwide scene, bringing faith into worldwide action and enriching our own spirituality with international perspectives and information. Moreover after arrival at the UN, NGOs encounter multiple possibilities for ecumenical and interfaith collaboration. No organization, however, not even the United Nations or any of its specialized agencies, can alone solve the global problems which are constantly brought to its attention, if its concerns are not shared by all the people. It is then the privileged task of the non-governmental organizations to help bring these concerns into the communities and the homes of the people, and to bring back to the established agencies the priorities and aspirations of the people, so that all the solutions and projects which are envisaged may be truly geared to the needs of the human person. Augustine ministered on three levels of community: local, national and world, so our Augustinian UN presence today is in his spirit. Centuries ago Augustinians fought hunger with immediate relief, giving food to the hungry. More recently but without abandoning immediate relief, we began to fight hunger on national levels through collaborative projects and policy advocacy. And most recently but without abandoning immediate relief and national advocacy, we can now join the worldwide fight against hunger through UN agencies: the UN Food and Agriculture Organization (FAO) to strengthen world food security; the UN World Food Programme (WFP) to provide effective food and nutrition assistance where critically needed; the UN International Fund for Agricultural Development (IFAD) to combat rural poverty especially in developing countries. What is true for feeding the hungry is true for all the ministries to Jesus suffering in any way in the least of his brothers and sisters (Mt. 25). In 1987, one year after Pope John Paul II recognized Augustine’s ministry as operative on the three levels of community – local, national and world-wide—his encyclical Sollicitudo Rei Socialis (9) directed the entire Church to embrace this same pastoral scope. “In the first place, a possible misunderstanding has to be eliminated. Recognition that the ‘social question’ has assumed a worldwide dimension does not at all mean that is has lost its incisiveness or its national and local importance…On the contrary (issues) depend more and more on the influence of factors beyond regional boundaries and national frontiers.” This is why the Church is at the UN. This is why the Augustinians belong there.